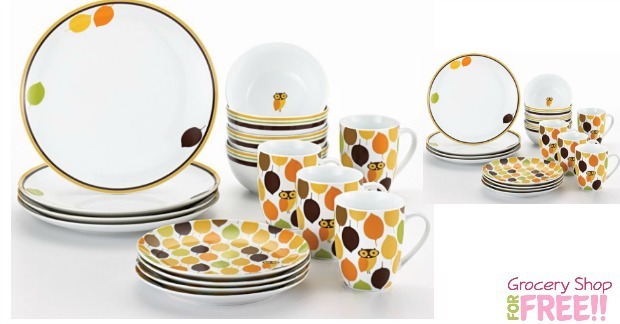 Rachael Ray Little Hoot 16pc Dinnerware Set Just $30.52! Was $140! You are here: Home / Great Deals / Amazon Deals / Rachael Ray Little Hoot 16pc Dinnerware Set Just $30.52! Was $140! How cute s this little owl set?! You can get this Rachael Ray Dinnerware Little Hoot 16-Piece Dinnerware Set for just $30.52 right now! This set is normally $140! What a great deal! Inspired by Rachael’s love of owls and her casual approach to entertaining, the Little Hoot dinnerware pattern sets any table with a fun, contemporary look everyone will appreciate. 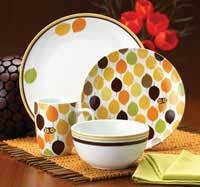 The dinner plates and cereal bowls feature a more understated look with striped rims and a minimal design, while the salad plates and mugs complement with a more prominent pattern. Guests are sure to enjoy seeing Little Hoot peak out at them from their chicken enchiladas, pesto pasta or any other treats that are on the menu. The playful design of this Little Hoot dinnerware by Rachael Ray is great for entertaining friends with a stylish look and a fun, contemporary pattern. Rachael’s dinnerware collections are great for everyday meals and for special occasions too. Each piece in this Little Hoot set is designed to create a complete table setting to showcase impeccable style along with delectable food. While style is key, convenience has not been forgotten _ every piece in this Little Hoot set is microwave safe and dishwasher safe. All components of the collection complement each other with matching leaf patterns and the signature Little Hoot, a character everyone is sure to love! The Little Hoot pattern fits the bill for casual entertaining, everyday use or special occasions. 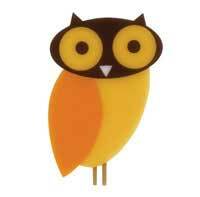 This design features beautiful, rich colors in a leaf pattern and, of course, Little Hoot, the playful owl. These pieces are crafted from sturdy porcelain and are durable enough to use every day with confidence. 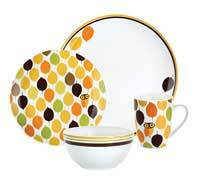 This dinnerware set is microwave and dishwasher safe for convenience and easy cleanup. The dinner plates and cereal bowls feature a more understated look that complements the salad plates and mugs that have a more prominent pattern. The Little Hoot owl in the bottom of the bowls is especially fun to surprise you when you finish your cereal in the morning. Rachael Ray Little Hoot soars into additional dinnerware and serveware styles, including holiday patterns. Rachael Ray doesn’t stop here! Look for her very popular cookware, stoneware, bakeware, teakettles, tools and new dinnerware collections to help complete your colorful kitchen statement.